The Regional Geoscience Division is responsible for conducting airborne geophysical surveys, geological mapping and the production of geological/ geophysical map data, which are available both in digital and hardcopy format. Details of available maps and digital data are given in the downloadable catalogue. Maps at 1:1 000 000 scale cover the whole of Namibia, while more detailed, smaller scale maps currently exist for approximately two thirds of the country. Currently 1:250 000 digital geological maps are being compiled to complement the high resolution geophysical surveys being conducted. The activities of the mapping subdivision are divided between new field mapping in structurally complex terrains and the compilation of archival maps in digital format. All data are captured and stored using ArcInfo GIS software and contribute to building up the national geological database. Currently 17 areas, mainly southern and central Namibia, are available in the 1:250 000 geological map series as hardcopies and/or in digital format, with several others in preparation (see index map). With more than fifty percent of the surface area of Namibia being covered by aeolian sands and other younger sediments of the Kalahari and Namib Deserts, geophysical techniques are important in recognising the geological/economic potential under such cover. In recent years approximately 1 million line kilometers of high-resolution surveys (magnetics/radiometrics) have been flown over various parts of the country covering about 22% (see index map). Complete magnetic coverage at 1:1 000 000 and 1:250 000 scale is available from older, less detailed airborne surveys; electromagnetic surveys exist from several areas of potential economic interest. In addition, data from more than 2000 gravity stations scattered all over the country are represented in a nation-wide gravity map. Due to the semi-arid to arid climate and subsequent sparse vegetation the use of satellite images and aerial photographs has proved very successful as an aid to field mapping in remote and inaccessible areas of rock outcrop. 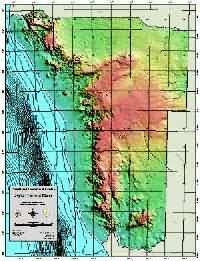 Image processing software (ERDAS Imagine, ER Mapper) is used to enhance and analyse such data and to produce preliminary geological maps to be verified by later field mapping.